Christmas entertaining and big football game food can be a bit healthier if you head in to the chicken sausage assortments at the store so many varieties to choose from and there are many great recipes to choose from, but for quick festive appetizers on today’s menu, I chose the red and green pepper sausages, browned and skewered with artichoke heart quarters, sun-dried tomatoes, and fresh basil. I have a bunch of little plates so I didn’t care if they stood on end and it’s just us and football snacks today. 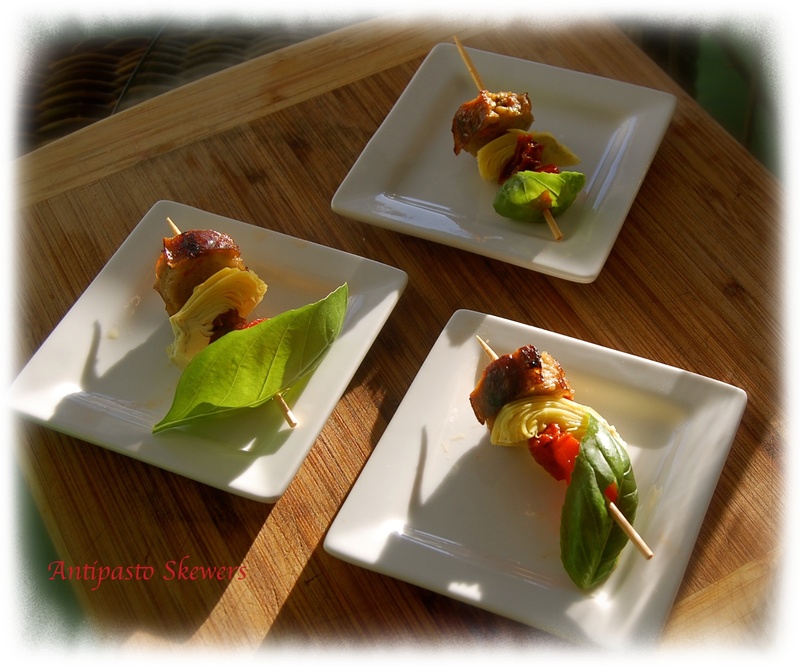 Thread 1 small or 1/2 large basil leaf onto a small wooden skewer. Add a piece of roasted red pepper, sun-dried tomato, artichoke and sausage, arranging them on the skewer so that it can stand up on the sausage end. Repeat with the remaining ingredients to make about two-dozen skewers.